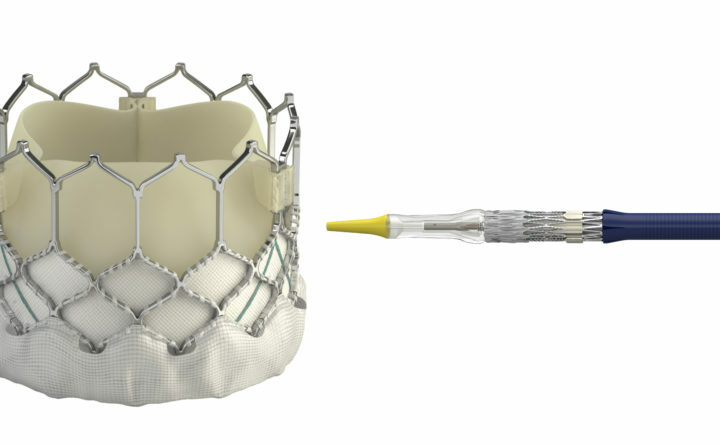 This combination of images provided by Edwards Lifesciences in March 2019 shows the Sapien 3 heart valve expanded, left, and crimped for insertion. Surgery for certain bad heart valves may soon become a thing of the past. New studies published by the New England Journal of Medicine on Saturday, March 16, 2019, suggest it's OK and often better to have a new valve placed through a tube into an artery instead. A hospital in Lewiston is one of 71 medical centers nationwide to test a procedure that it said holds promise of helping millions of Americans with blocked heart valves get treatment without requiring surgery. The procedure also holds potential to decrease hospital stays and costs for lower-risk patients. Central Maine Heart and Vascular Institute, which is part of the Central Maine HealthCare system, tested a medical device called a trans-catheter aortic valve replacement, or TAVR. That device resembles a mesh circle that is bound tightly when inserted into a patient’s groin artery and threaded into the heart, where it expands and replaces a clogged aortic valve. The aortic valve pumps blood through the heart. While these types of devices have been used successfully for the past decade to treat high-risk patients too fragile to undergo surgery, they have not been used in patients who are lower risk and can withstand heart surgery. The study was performed at 71 medical centers with 1,000 patients. The results were published in the March 16 issue of the New England Journal of Medicine. The study found that one year after the procedure, the rate of death, stroke or re-hospitalization among the lower risk patients was significantly lower than if they had surgery. Hospital stays were shortened as well, reducing costs, according to the Lewiston hospital. More than 5 million Americans are diagnosed with heart valve disease each year, and most of those have aortic stenosis, a buildup of calcium in the aortic valve that can lead to heart failure, according to John Muir Health. The new study suggests that open-heart surgery may not be needed on as many patients in the future. Eisenhauer said more long-term studies need to be done because this test only studied patients one year after surgery. Studies also need to be done on patients who are born with deformities of the aortic valve or very young patients to see it the device works well. CMHVI, has done 181 TAVR procedures since 2015 on medium- and high-risk heart patients. Other hospitals in Maine also have performed the procedure. Maine Medical Center Cardiovascular Institute states on its website that it was the first to perform the procedure in Maine. The study was sponsored by Edwards Lifesciences of Irvine, California, the company that makes the devices used in the study. Clarification: Central Maine Heart and Vascular Institute is testing the procedure for lower-risk patients in hopes of lowering costs and eliminating the need for surgery. Other hospitals in Maine have used the TAVR procedure for higher-risk patients.